Leslie Ackerman, Diane Taylor Salvaryn, Jake Jacobson, Joseph Becker, Laura A. Van Vleet, Michelle Neff, Margarita Teresa, Kieren van den Blink, Steve Cates, and Glorious Johnson. Since Donald Trump took the oath of office as U.S. President, it's been clear that he should be impeached. From his cozy relationship with Russian leader Vladimir Putin, to his myriad conflicts-of-interests arising from his business dealings, his thinly-veiled attempts to ban immigrants based on religion, his attacks on the 1st Amendment rights of journalists, his apparent disregard for the U.S. intelligence community, and his gross incompetence as a leader time and again in the wake of tragedies, Mr. Trump has shown that he is not only unfit but also unsafe to serve as president. Following Trump's efforts to obstruct justice by firing James Comey, head of the FBI who was overseeing the investigation into the administration's ties to Russia, Robert Mueller was appointed as the new special counsel. His investigation into the Trump Administration's ties to Russia has been heating up for months. Now, it appears that the Mueller is even closer to uncovering collusion between Trump and Russia. According to new reports, former national security adviser Michael Flynn has pleaded guilty to making false statements to the FBI about his contacts with Russia and is expected to testify that Trump instructed him to reach out to Russian officials during the campaign. For months, the evidence against Trump has been mounting, and now it's becoming impossible to deny: Trump colluded with Russia during the 2016 presidential election. 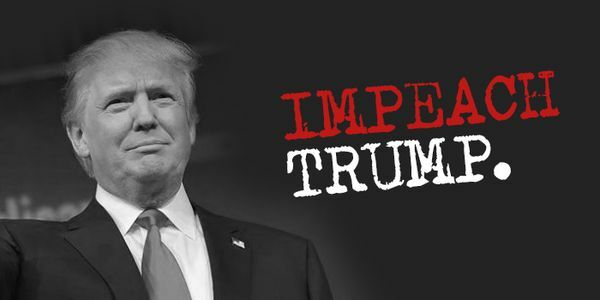 Sign this Impeach Trump petition to ask the U.S. House of Representatives to Impeach Donald Trump NOW. Here are the ways in which an impeachment could be carried out. Trump has been accused of harassing or sexual assaulting 20 women, yet another reason this criminal does not belong in the White House. For Sexual Assault Awareness month (April), we will be reminding everyone of this fact by projecting onto Trump hotel in DC on Monday April 16th at 8:15 PM EST. Join us on FB live and keep sharing the petition! BREAKING: Former national security adviser Michael Flynn has pleaded guilty to making false statements about his contact with Russia to the FBI and is expected to testify that President Trump instructed him to contact Russian officials during the 2016 campaign. Please share this petition so we can keep the pressure on. BREAKING: Special Counsel Robert Mueller has impaneled a grand jury in Washington, signaling that his investigation into Russian interference in the 2016 election is picking up. Please share this petition so we can keep the pressure on. The New York Times is reporting that Donald Trump Jr. met with a Kremlin-connected lawyer during the 2016 presidential campaign after being promised damaging information about Hillary Clinton. Evidence of collusion between the Trump campaign and Russia is mounting. It's time to impeach Trump. Please share this petition today! The NYT is reporting that Trump once asked former FBI Director James Comey to shut down his bureau’s investigation into Trump’s former national security adviser Michael Flynn. This is hugely problematic! It's time to impeach him. Please share this petition!